Jessica Sporn Designs: Good to Grow! I met many amazing people at Art is You, and will be telling more about them as weeks go on. One of them is Mary Beth Shaw, a mixed media artist and founder of the company StencilGirl. Although I wasn't able to take a class with Mary Beth, I really admired her work and loved her stencils. One of the coolest things about them is that they are designed by artists for artists. We talked a bit about my licensing work, and when I got home, I sent her some patterns I had created and ... YES! I am going to be a StencilGirl designer! THANK YOU to my roommate, Judy Shea, who brought me down to the Art is You trunk show after dinner and introduced me to Mary Beth. Stay tuned, and I will give my readers a first peek at the new line as soon as it is ready, and also a giveaway of one or more of them. more doodling with white and black gel pens. So happy to memorialize another chance to grow! I hope you're still with me because Scrapping the Music has two amazing prompts up on it's page. I blogged about the first prompt here. The second prompt is to make art around a song that brings out the rebel in you. After thinking about a bunch of my favorites, like "Devil with the Blue Dress," "Honky Tonk Woman," and Parliament's "Give Up the Funk," I chose Ricky Martin's "Livin' La Vida Loca." I love the latin beat of this song, the combination of Spanish and English, and the lyrics -- the describe a sassy, devil may care, lady. It's fun to pretend sometimes! I hope you'll join in this fun challenge! We're almost at the end of the first week of the second Fall Fearless & Fly challenge. Check out the links at Artists in Blogland -- the work is amazing! Linking up with Paint Party Friday and Creative Everyday, as well as the links above! Fantastic news Jessica-congrats!!!! 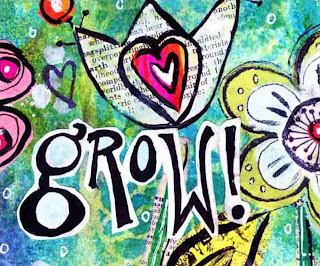 "Good to Grow" is absolutely delightful and makes me smile all over! congrats to you Jessica :) I will stay "tuned in" and cant wait to see! Love your fun pages! Congratulations! And thanks for the fun tips here too! Your flowers are amazing! I can't tell you how excited I am for you. I can't wait to see your stencils. They will be beautiful if they are anything like your journal pages. Two of my favorite people.. you and Mary Beth. Glad I made you take another swing through the show. Meant to be, I guess. I just ended up spending more. Mega mondo super congratulations! I can't wait to see what stencils you create! I enjoy your art so I know I will love your stencils! Love that journal page. And congrats on becoming a StencilGirlDesigner. Sounds exciting! Congratulations on your stencil design gig. That first page is fantastic! Your page is terrific and how exciting, congrats on becoming a Stencil Girl Designer! Happy PPF. Jessica....these are so beautiful and the details and colours are amazing!! Congrats on your new design job!!! how exciting!!! Holy smokes so many layers! It's awesome! Oooh a stencil girl designer. Wowee!! Congrats! Enjoy. Love your pages and color. Very nice. Thanks. HAPPY PPF! ALL LOOKS AMAZING! I love your vivid flowers! The Art is You must have been a spectacular opportunity, Jessica. What fun! 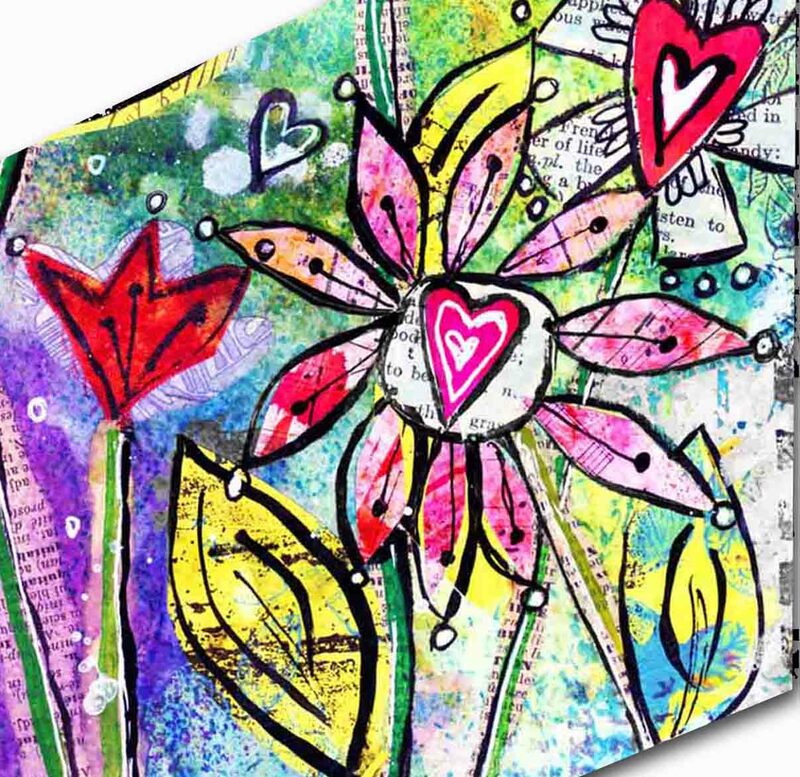 Your collages are wonderful and congrats are in order for being a stencil girl designer! I think your art today has a Teesha Moore quality. Especially your handwritten text. Fantastic news! I'm so happy for you over this new adventure in stenciling, and I love the page you made for the 2nd Floor Challenge. This page is vibrant and totally makes me grin. Hi Jessica! 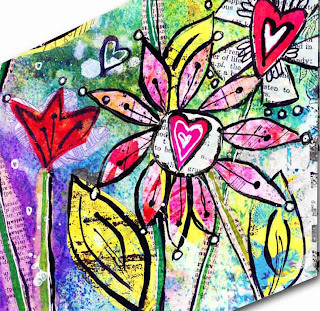 I'm stopping by from Art Journal Everyday/Balzer Designs. Love your art, especially your happy colors and designs! I'm your newest follower and would love it if you would come over and follow me back! Congratulations on your new adventure into stencil design, look forward to seeing them! I adore your style and your use of color! And congratulations on becoming a Stencil Girl! 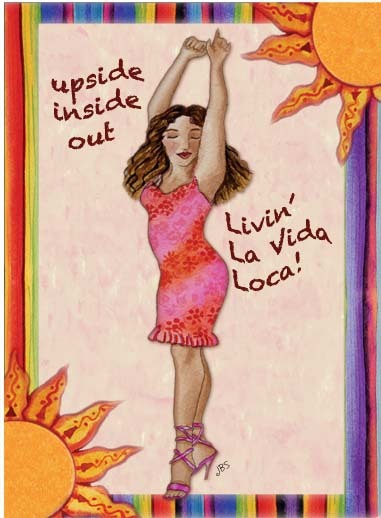 And I LOVE Judy Shea's art and blog...wish I could meet her and you in person and make art with you, too!! Can't wait to see your stencil designs! congratulations... you will be such a great addition to their line up... they are lucky to get your talents!!!! 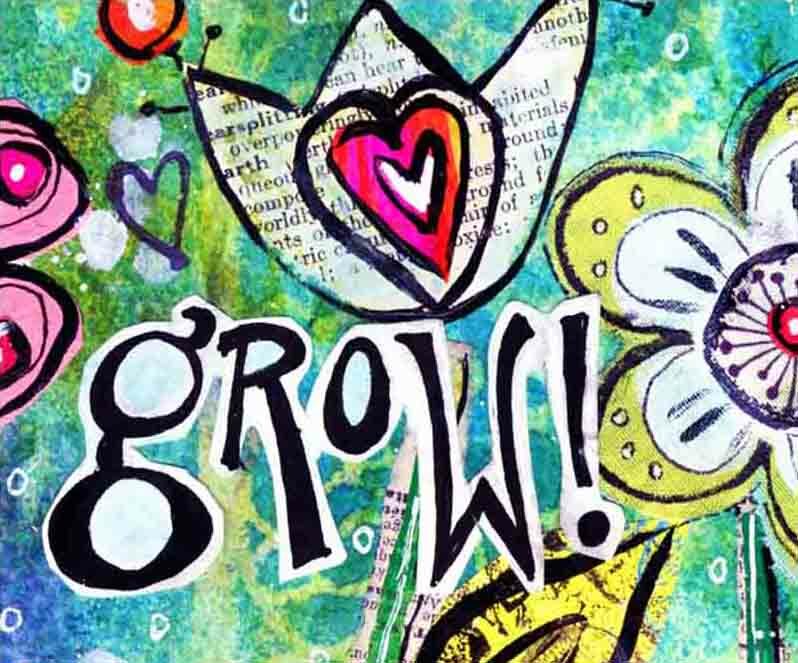 Love the 'Grow' page and the sassy, fun lady! Wishing you all the best for the new design journey! Thank you everyone for the kind words and warm wishes. I love this community so much. 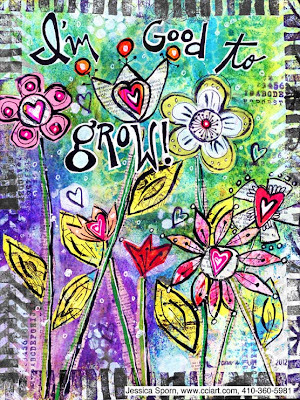 Love the Good to Grow art. So pretty & colorful and I love the print under it. Your page is gorgeous, adore the bright and colourful flowers. Congrats on the design job , I'm sure it will promise much excitement and new discoveries for you, enjoy! Congrats on the design job. Your work is gorgeous. love the sentiment. First off congratulations on the design job!! Excellent pieces this week...love the color and whimsy!! Also great idea about take prompts from songs! !Love everything here!! Excellent! !I leave filled with joy!! Congratulations to you! I can imagine how excited you must be:) Great post - the art and the words -especially the steps. Gorgeous pages! And congrats on your news! Gorgeous!!! And congratulations about your designs!